Shottle Hall in Derbyshire is a fantastic wedding venue - it's a stunning country house, set right in the heart of the rolling hills and countryside of the Peak District that's perfect for wedding celebrations. Chantelle, the bride featured in this photo, opted to get ready at Shottle Hall for the morning of her wedding. I had spent most of the morning with her, capturing every detail of her exquisite day, from her wedding dress and shoes to her earrings and perfume. I love documentary wedding photography however; it's how I started wedding photography - second shooting at weddings means you have little input on the wedding day and your only option is really to shoot in a candid way. That's no bad thing, after all, this is what gives you the most realistic representation of your wedding day. The key to being a great documentary wedding photographer is knowing to be in the right place at the right time. It's not something that can be taught - it's something that needs to be learned through the experience of wedding after wedding. 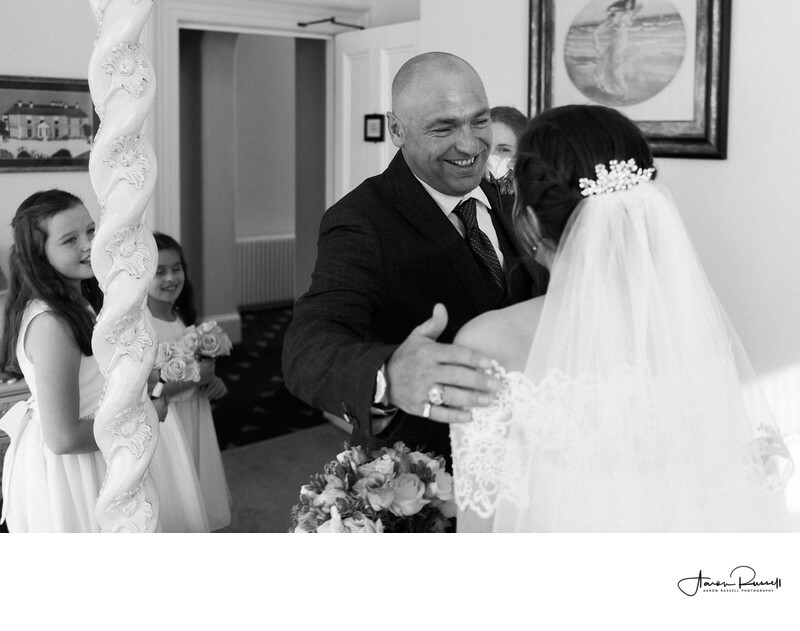 One such moment came when Chantelle's father came to see her for the first time in her wedding dress. This is always a favourite moment of mine, as you never quite know the reaction that you're going to get. As Forrest Gump would say - life (or weddings for that matter) is like a box of chocolates! When it comes to taking emotional photos like this, you (as a wedding photographer) need to know where to point your lens. Just being there simply isn't good enough. I knew that the best reaction would come from the father of the bride, and chose to shoot over the bride's shoulder, looking back towards where her father was going to walk in. I set my camera to the fastest shooting mode and tracked the dad as he made his way into the room. He was completely oblivious to my presence, and acted completely naturally. This allowed his true emotions to be shown, which are evident in this photo - that overwhelming sense of pride and joy, seeing his daughter going from being just that, to being a bride. Black and white always works well for documentary wedding photography. Don't get me wrong - you can take fantastic reportage wedding photos and display them in colour, but at certain times, colour itself becomes the distracting feature of an image. Making an image black and white removes any possible distraction, and allows you to focus in on what's really happening in the photo itself. Location: Shottle Hall, White Lane, DE56 2EB.